Women's promotional t shirts are a great way to show clients and customers that you appreciate the business of your female consumers! ePromos carries an expansive range of customized apparel that ought to suit your needs as you promote to women. Our ladies' custom t-shirts are stylish, comfortable, and well-fitting, and they're sure to be worn more often than an ill-fitting men's tee. Gifting these custom logo apparel items to your female employees and customers is a good way to showcase your company's acknowledgment and understanding of women's interests and needs. 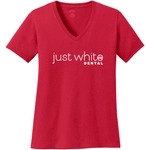 ePromos carries several different styles and brands of women's promotional t shirts, all waiting for your customization. Choose from fitted tees with v-neck and crew-neck openings, performance tops, camouflage-inspired tee shirts, long sleeve ribbed tops, tanks, and dozens of others. We're sure you'll find the perfect ladies' custom t-shirts to feature your company logo or business name. We can even work with you to continue your eco-friendly commitment by screen printing your logo onto organic cotton tops. When you show up for your next promotional event, expo, or trade show armed with custom logo apparel in women's styles, you'll be immediately reaching half of your clientele with a wearable version of your brand. You can also order women's tops to outfit a company sports team, give away at fundraisers, reward race finishers, or market to a particular demographic, like moms or college students. The possibilities are endless! Treating your customers and clients to stylish promotional t shirts is a sure-fire way to ensure they wear them again and again. Each time someone slips on a tee customized by your company, they'll be a walking (or jogging!) advertisement for your brand. Shop ePromos first for all your promotional apparel needs – we have the best customer service, selection and prices!